-Take the main road leading in the direction of the National Park of La Restinga. -Cross the bridge, and head towards Punta Arenas or Robledal. 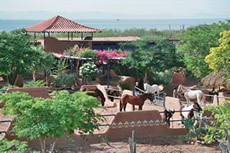 -Cabatucan Ranch is located at 9 km from the bridge and about 2 km from Guayacancito.